We are backpackers hostel, established in 2008, as a 6th branch of K's House Group. 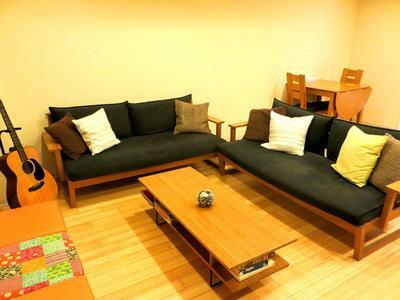 (K's House has 12 branches in total throughout Japan, as of now) We have been welcoming travelers from all over the world (more than 110 countries), and we have the atmosphere of the typical backpackers hostel. You can meet and interact with new people from different countries every day, which is one of the reason you can experience by staying with us. Hiroshima is not such a big city like Tokyo or Osaka, but is still very comfortable to live in. There are many restaurants and bars downtown, and you can enjoy "Okonomiyaki" (it has noodle inside, so it's different from Osaka-style one) and oysters, which are the 2 major food we recommend to try. Also, you can enjoy and experience the historical aspect of the city. The Peace Memorial Park, The Museum of The Peach Memorial, and the Atomic Bomb Dome are the representative sad heritage of the war. Miyajima (Itsukushima Shrine) is also a place we can recommend to visit. You've probably seen the photo of the red gate (called "Torii"), which looks floating on the peaceful ocean. The dawn and sunset there is incredibly beautiful. Furthermore, we have our local professional baseball team,"Carp" We have been winning 3 years in a row in the "Central League", and is quite popular throughout Japan. The stadium is just walking distance from our hostel ! Why don't you volunteer at K's House Hiroshima ? Our staff are all very friendly and speak English. 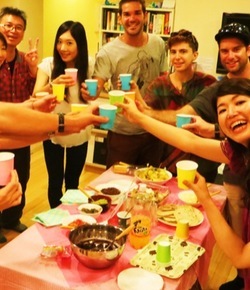 We are all Japanese, so we will help you to lean Japanese if you are interested in it. The duty is cleaning and housekeeping. We ask you to help us to clean the guest rooms and common spaces, such as shower rooms, restrooms, and so on. In exchange of your duty, we will provide you free accommodation, and partial food supply for self-cooking. For more details, feel free to ask us. Also, you can enjoy the staff discount when you stay at any K's House branch all over Japan !